Buying a Men's Suit on eBay? That's crazy talk! 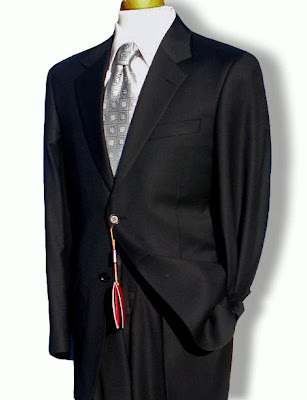 : How crazy is it to buy a men's suit, sight unseen mind you, on eBay? How crazy is it to buy a men's suit, sight unseen mind you, on eBay? 1.) The selection in my size was pathetic. Keep in mind, I am a large man, but no larger than the three other guys who were also trying on suits at the same time as me. 2.) The prices were outrageous! These were suits that started at $299 for the jacket, and when up from there. Come on now. I’ve been to Jo Ann Fabrics. There can’t be more than $40 in material in these suits, and no more than a couple hours labor. I made a tee shirt in Jr. High Home Ec class 30 years ago, so I’m clearly a voice of experience here. 3.) Everything was made in China! Now, I understand lead Happy Meal toys, Dollar Store items and crappy Zippo knock-offs coming from China, but men’s suits? And remember, I’m not talking about cheap suits either. At that point I decided that I didn’t know enough about buying a suit to make a good choice, so I did what I always do. That’s right, I’m not known as “The Googler” for nothing. What I found was that by and large the production of men’s suits has moved away from what we all think of as the center of the fashion world (Milan, Paris, and Houston) and has moved to mainland China. From there I actually joined a news group for clothiers, where I began reading everything I could about suit construction. What I learned was that a few years back just like welding and painting on the automotive assembly line, CNC (Computer Numeric Controlled) machines started to take over many of the manual tasks that used to require the most skilled hands. Clothing manufacturers actually have machines that look a lot like huge printers, where instead of ink the fabric is cut into all the pieces needed for the suit. Oddly enough, once I got to Germany I got to see one of these machines in action. It was mind blowing! Anyway, I also learned that not everything on a suit is actually stitched together. Many parts of a suit are “fused” together, which is to say that they are glued! More on this later, but for now I must be off. Great, learned a lot of suits online buying site. Lots of cheap suits foe men. Thank you so much and more power. It's not crazy to buy on eBay because we all want to save money yet get quality suits on inexpensive mens suits. I start with baroni suits in my corporate life and I got attached since the day I first wear it and received compliments. This is awesome but I'm looking Wedding suit for men for my best friend. It is not practical at all. not a wise thing to do. Staying in style is an on-going process and one that can often be challenging and perplexing.